It would be so great, if Sofia, Elena and even Pilar and Margarita attended the State Banquet! Alas, I fear it will be only Queen Letizia with the floral tiara. But if Queen Sofia attends, I hope that she'll wear the shell tiara and that Letizia gives one of the pearl tiaras a go (and I don't mean her own Ansorena tiara, but one of the old ones, Queen Ena's or the Cartier Loup tiara). I am hoping Letizia will wear the FDL tiara as this seems a like an event that is more special than others. I think its a hard to guess what the ladies might wear. Maxima Ruby Parure, Saphir, wuerttemberg pearls. In the past we have seen these Tiaras during Luxembourg/Dutch state visits. Would be a great time to bring out the Stuart tiara. And Maria Teresa in the Empire tiara. At her first State Visit to Luxembourg in the 1980's Beatrix wore the big sapphire tiara. Exciting! And so difficult to guess, because both houses have such a large tiara collection! As for Maxima, I don't think that she will bring out the Stuart Tiara abroad. So I think she will wear either the large sapphire tiara, or the Württemberg pearl tiara. It would be great if she opted for the full versions with all the pearl prongs for the first time. The Grand Duchess will probably also go big. It would be a good occasion to bring out the large Empire tiara. Alternatively I'd like to see the wine leaves tiara, which is also pretty big. With a Dutch visit, there's a pretty good chance that Alexandra and Claire will attend too. It's difficult to guess, because the Luxembourg's do a lot of jewels sharing. So I hope to see some of the Princesses with a first-time tiara. Stephanie could wear the aquamarine bandeau, and Claire the small floral tiara and Alexandra the sapphire laurel tiara. I can't stop grinning. This is something to look forward to! I'd love to see MT bust out the Empire Tiara one more time. I think I'm right in saying Maxima wore the ruby tiara for Gui & Stephanie's wedding so I think she'll give it a miss. Maybe the large sapphire or the Wurttemberg tiara. Love it if she wears the House necklace. I think the Stuart tiara is a larger possibility than usual. Obvious events for an re-introduction would be a state visit to the UK or a big birthday/ anniversary. There are no big tiara events expected in the Netherlands in the next (15?) years, especially now the King's birthday did not seem to be upgraded to a tiara event, which likely will be repeated during other personal celebrations. A state visit to the UK is unlikely to happen in the next 5 years at the very least. A return visit can only take place after that and is unlikely to take place during the present reign in the UK. A visit to the other branch of the Nassau family, to a grand duchy that was once ruled by the house of Orange is also 'special'. Queen Juliana and Beatrix always treated it as such, perhaps the king will do so too. Perhaps it is the 'best' scenario for such an introduction if we exclude the possibilities listed above. If the queen intends to ever wear the piece at all. The queen has slowly introduced the devant corsage and the necklace. Perhaps it is time for the rest of the parure now. All other disappeared items from the collection have been re-introduced as well, including the peacock tiara and necklace, the big bow brooches etc. But of course the sapphires or rubies are still more likely. As for the Luxembourg's: I suspect that the Grand Duchess will not want to overshadow the Dutch guest, which means we will sadly not see the magnificent Empire tiara. But I feel like they maybe just bring out their "ordinary" pieces e.g. Mellerio ruby/sapphire or Belgian Scroll (......I know it's very weird to call these grand pieces "ordinary"......). I don't know why and I hope I am wrong. It is not for granted that the Grand-Duchess will wear her most imposing diadem. Look what she wore when Queen Beatrix made her State Visit to the Grand-Duchy in 2012: picture. My guess is that Queen Máxima will debut the Stuart during an incoming royal State Visit with a guaranteed big gun worn by the lady guest. 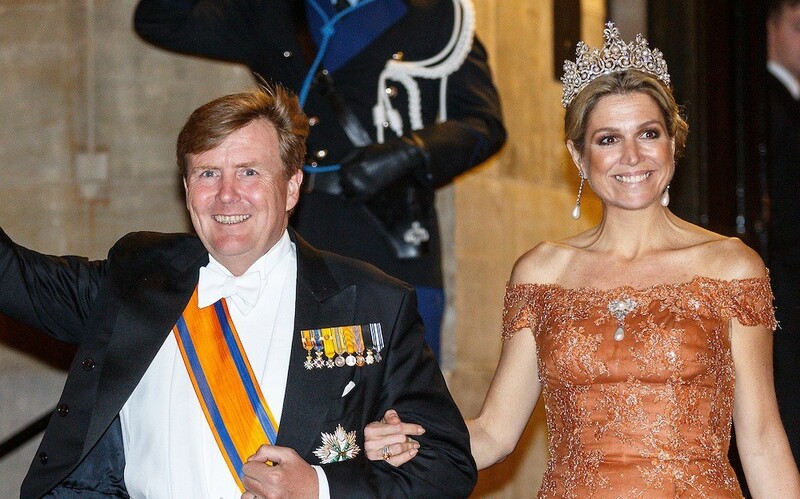 I hope Queen Máxima will wear the Württemberg, which she wore fabulously in 2015: picture. But then in full setting, with all eleven upright pearls... picture. I wonder what royal visit that would be. Queen Silvia doesn’t wear the Braganza tiara outside Sweden;, her default tiara for outgoing state visits is the Leuchtenberg, which doesn’t call for the Stuart IMHO. The Danes don’t have any big tiara. Queen Margrethe’s default tiara for state visits is normally the Pearl Poire. Queen Sonja would probably wear her emerald tiara and Letizia might wear the Fleur de Lys , but would any of those be worth taking the Stuart out of the vaults ? In fact, the only royal lady I can think of who might wear a big gun in a state visit to the Netherlands prompting Maxima to wear the Stuart would be Camilla when she is queen or princess consort, but that won’t happen (hopefully) in the near future. The visit of Grand-Duke Henri to the Netherlands saw the Nassau lady debuting her biggest diadem. The Orange-Nassau ladies however were just modest: picture. In June, there will be Dutch state visits to Latvia, Estonia and Lithuania. Anyone think there will be at least one tiara event? Will there be a separate state banquet for each visited country ? If so, we can expect three back-to-back tiara appearances by Máxima. She normally wears tiaras even when the state dinner is black tie. The only situation where she won't wear a tiara is if there is no state dinner, or the dresscode is business suit. Who knows what we can expect this time . King Carl Gustaf and Queen Silvia pays an official visit to Japan, 22-25 April. It seems like the Emperor and Empress give a dinner for their guests. Thus, maybe tiaras? Queen Silvia didn't wear a tiara in Lithuania in 2015. So maybe there won't be a tiara at all. Or maybe, only one of the countries will host a black tie banquet and the other countries have another dress code. But I don't have my hopes up too high. Perhaps if we are lucky. But somehow i doubt it. In Japan when there are State Visits from presidents etc. the State Banquets are often not white tie but black tie instead which means in Japan no tiaras. So even if there is a black tie dinner i would not expect Queen Silvia to wear a tiara. I can't remember an official visit to Japan that included tiaras. So I don't think that we will see tiaras for the Swedish visit. But isn't there a Commonwealth Meeting in London on 19-20 April? That should mean tiaras in London, shouldn't it?